I first saw this book at a book fair we had at work and it, of course, caught my eye. A comprehensive collection of 15 minute workouts? Of course that would catch my attention. I passed it by though in honor of my family's budget (I'm such a martyr, I know). Then, I put the book on my Amazon wishlist, where it's been for quite some time. Then, the book fair came back to my work months later. I didn't think they'd actually have the same book again as their selection is ever-changing, but they did! I finally bought it. When something has been on your wishlist for that long, you know it's time. So far, I'm loving the book. Instead of all those scraps of magazines lying all around my house, I now have a perfectly bound book of them all in one place. Ahhhh. This must be Women's Health's way of creating feng shui throughout the homes of magazine workout page hoarders. Tell me I'm not the only one, please! 1. The variety of workouts: this book has workouts of all varieties--everything from weight lifting to martial arts to yoga and pilates. All in one place. My workouts always depend on the mood I'm in, how sore or stressed out I am, and where I am. 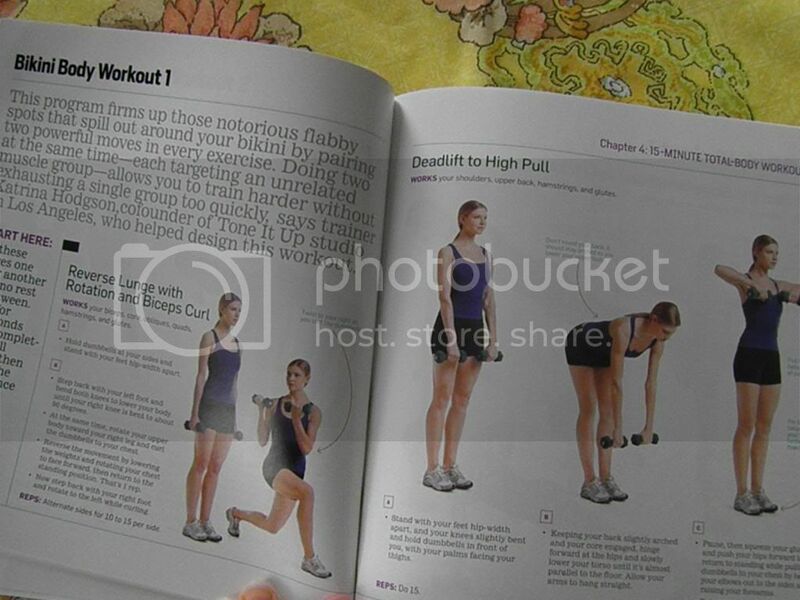 There is a workout in this book for every mood and every level of fitness equipment access you have. 2. Doable time limit: everyone has a spare 15 minutes, right? We twiddle away time on all sorts of so-called extracurricular activities (Pinterest browsing, anyone?) We can certainly find 15 minute increments throughout our week to fit in these exercises. See my post on finding time to work out if you're not convinced. 3. You can easily combine workouts: 15 minutes might not cut it for some more serious exercises. Well, all you need to do is combine two or more routines or perform the circuits a few extra times. Simple as that! 4. Trip-friendly: I plan on packing this book the next time I head out of town. Many of the workouts require little to no equipment. Instead of trying to dig through my stack of magazine workouts to find do-anywhere moves, I can just pack this one book. Simple! 5. Pretty pictures and quality cues: the quality photography and physical cues lead you through the workouts without too many questions. I have not come across an exercise yet that made my eyebrows furrow and wonder "what are they talking about?" Each move is pretty crisp, clear and comprehensively described. 6. Price: the price was super friendly at the book sale--about 1/2 off the publisher's price. Even Amazon has the book for a cool $9.00 used. That's about the cost of 1.5 magazines off the magazine stand. I tried the stress-busting routine earlier last week and enjoyed the heart-pumping workout it gave me. A boosted metabolism and sculpted limbs? Um, yes please. Guess who I spied on the pages of the book? Tone It Up's very own Katrina Hodgson. I thought those moves looked familiar! They're pretty true to the Tone It Up style. Can't complain about that. Are you convinced to buy it yet? :) Or, do you know of any Android apps that offer this same type of thing? Because that would probably make me pass out in amazement. *Note: I was not compensated or solicited in any way to endorse this book. This is simply me giving my personal review. Good post. Thanks for sharing this post with us. The elaborateness of the planning is from time to time keen about the sort of fabric. If affordability is a difficulty, that is usually is, handwriting bracelet take into account the fabric of the personalised bracelet for it greatly affects the worth.